Tooth Extraction: What to expect during the procedure and helpful after care. A simple tooth extraction is usually performed usually under local anesthetic on teeth that are visible. This type of extraction requires only the use of instruments to elevate and grasp the tooth. The tooth is usually lifted using a tool called an elevator and grasped with dental forceps then rocked back and forth and rotated until the periodontal ligament has been broken and the supporting bone has been widened to make the tooth loose for removal. In this type of removal, a slow, steady pressure is applied with controlled force. Surgical extractions involve the removal of teeth that cannot be easily accessed, either because they have not erupted completely or they are broken under the gum line, requiring an incision. In a surgical extraction, the doctor may elevate the soft tissues covering the tooth and bone and may also remove some of the overlying and/or surrounding jawbone tissue with a drill or osteotome. An osteotome is an instrument used for cutting or preparing bone, which is similar to a chisel but bevelled on both sides. Frequently, the tooth may be split into multiple pieces to facilitate and expedite its removal. Surgical extractions are usually performed under a general anesthesia. The root portion of a tooth is firmly encased in bone (its socket) and it is tightly bound into place in this socket by a ligament. During the extraction process, the dentist needs to expand the socket (widen and enlarge it) and separate the tooth from its ligament to a point where the tooth is loose and free to come out. The bone of the jaw is compressible to some degree. That means if a dentist can apply firm pressure to a tooth, forcing it against one of the sides of its socket, the bone in that area will become compressed. The net result is that the socket becomes slightly enlarged. After repeated application of pressure to a tooth from many different directions, the entire socket becomes larger. The ligament that holds the tooth in place will become detached from the tooth too. Finally at some point, enough space will have been created and the ligament separated from the tooth enough that the tooth will come out. Understanding the dentist’s use of extraction forceps is more straightforward. The dentist will grasp the tooth with the forceps and then firmly and deliberately rock the tooth back and forth. They will also rotate the tooth as much as they can. The combination of these tooth movements expands the tooth’s socket and separates its ligament. The reason you will feel pressure during the tooth extraction process is because our bodies have different types of nerve fibers, each of which carry different types of sensations. Each of these different types of nerve fibers have different physical characteristics. The local anesthetics usually used are novocaine or lidocaine, this is injected into the area where the tooth extraction will take place. It will numb the area and is very effective at inhibiting the function of nerve fibers that transmit pain sensations, but it doesn’t have as great an effect on the nerves that transmit pressure sensations. 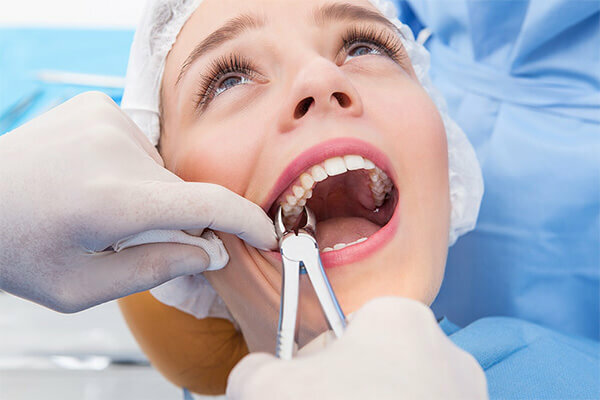 So, expect to feel pressure during the tooth extraction process, but do not assume that this indicates that you will soon be feeling pain, as the area is anesthetized and numb. It is possible that during a tooth’s removal that you will hear some of the noises associated with the extraction process. As an example, patients are sometimes concerned that they have heard a snap or breaking noise. In most cases, the event that has produced this type of sound is just a minor issue, usually one of the tooth’s roots fracturing. Because this “complication” happens so frequently, you can anticipate that your dentist has had plenty of experience in removing broken tooth roots, and will be sure that you do not feel any pain. Gum and/or bone tissue may cover over or surround a tooth in a manner that makes it difficult for the dentist to view and/or access it. If so, the dentist will need to remove this tissue in order to get to the tooth. Sometimes a tooth is so firmly anchored in its socket or the roots are so curved that the dentist cannot get the tooth’s socket expanded enough that it will come out. In this type of situation, the tooth will need to be cut into pieces or “sectioned” and then each portion removed individually. If your dentist suspects that you are at risk for infection, he may prescribe antibiotics before and/or after your tooth removal. Bruising may occur and is more common in older people or someone taking steroids, aspirin or other anticoagulants. It can sometimes take several weeks to disappear completely. Swelling occurs if there is trauma to the area. This varies in different people and will be greater if more surgical interventions are needed for the removal of the tooth. Dry socket or Alveolar osteitis is a painful phenomenon that most commonly occurs a few days after the removal of mandibular (lower) wisdom teeth. It usually occurs when the blood clot within the healing tooth extraction site is disrupted. It is a phenomenon of painful inflammation within the empty tooth socket because of the relatively poor blood supply to this area of the mouth/jaw. After a tooth is pulled, a blood clot forms in the socket to protect the bone and nerves underneath. Sometimes that clot can become dislodged or dissolve a couple of days after the extraction. That leaves the bone and nerve exposed to air, food, fluid, and anything else that enters the mouth. The only symptom of dry socket is pain, which often radiates up and down the head and neck. A dry socket is not an infection, and is not directly associated with swelling because it occurs entirely within the bony lining of the empty socket. It is sometimes treated by your dentist packing the socket with a medicated dressing to alleviate the pain. Smoking after a tooth extraction should be avoided, as this can prevent wound healing and cause a dry socket. Take the medication prescribed by your dentist, exactly as prescribed. Whether painkillers, antibiotics or anti-inflammatory treatment, any lapse in treatment is not an option. Rinse your mouth with salt water. At your dentist’s recommendation, slowly rinse your mouth with salt water, but not earlier than one day after the extraction. Salt is a natural antibiotic and also has anti-inflammatory properties. Keep your head propped up to avoid blood pressure inside the head. Only eat soft foods. Hard foods will prevent your blood from clotting and will re-open your wound. In addition, food remains will be very difficult to clean from inside your wound. Don’t use straws and try to limit mouth movement as much as possible. Keep your tongue away from the wound, as any disruptive movement will negatively impact blood clotting and healing. Take a break from strenuous physical activity. High blood pressure and increased pulse can cause your wound to reopen and cause bleeding. Avoid making any significant physical effort for a couple of days.